There are two options for trekkers. A person may chose to do a day trip. This would require some bit of fitness to cover 20 km to and fro in one go. 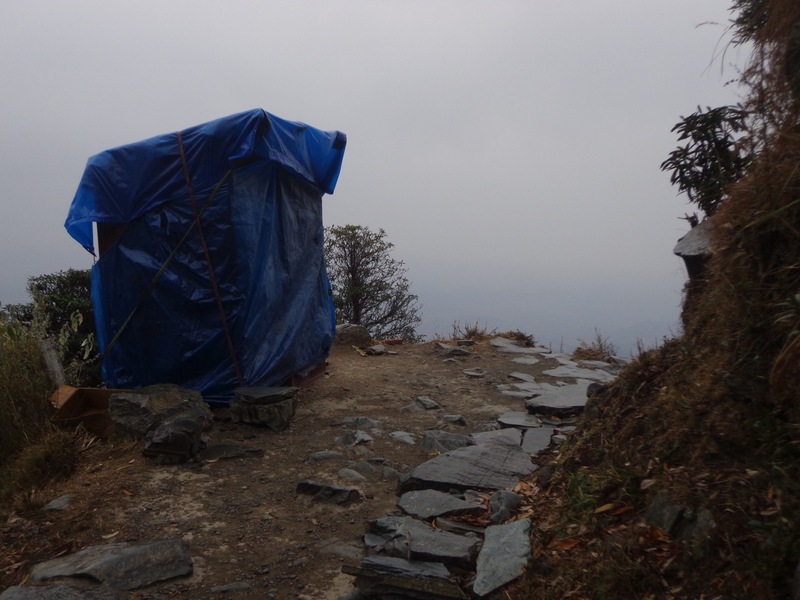 The other option is to get there, hire a tent and spend a night before descending the next day. I decided to do a day trip. 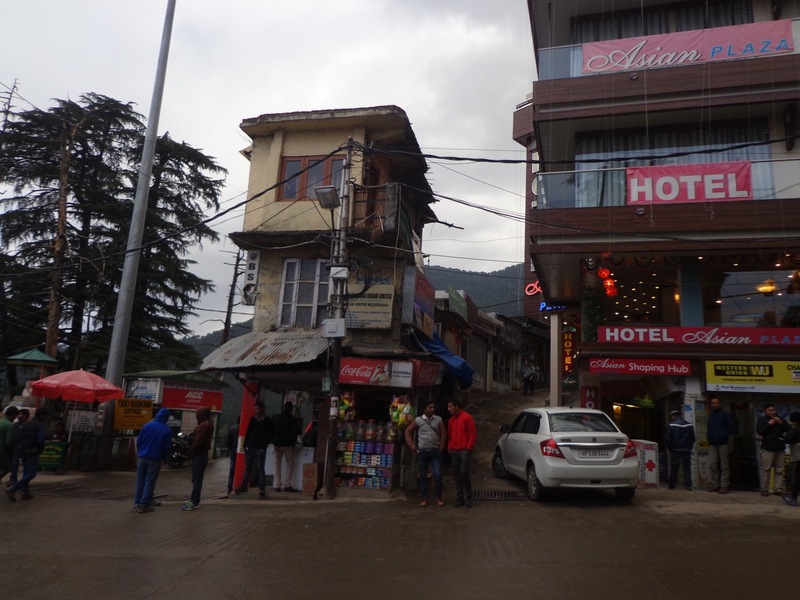 There are many ways to reach the first junction, Dharamkot. Here are two pictures that will help you pick the easiest one if you are on foot. 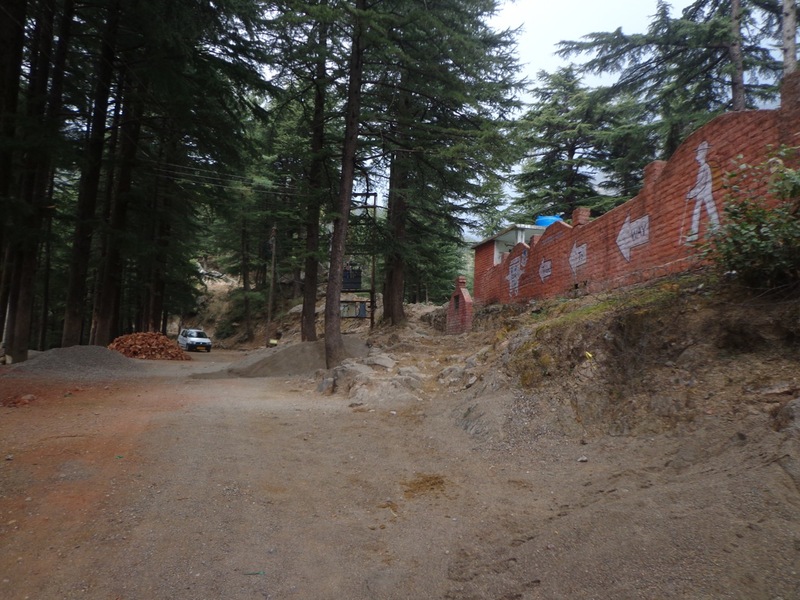 The small road sandwiched between the two buildings is the shortest route to Dharamkot. 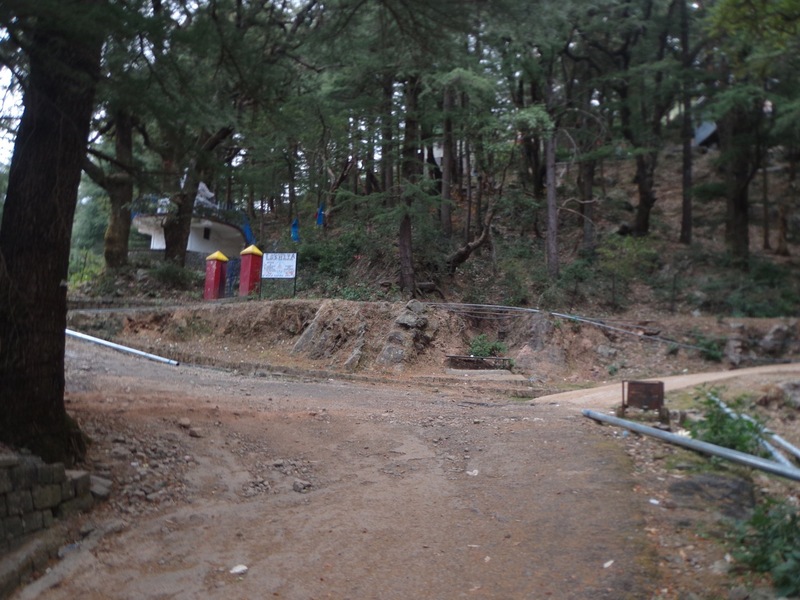 From the McLeod Ganj facing gate of Tushita Meditation centre, take the left trail. 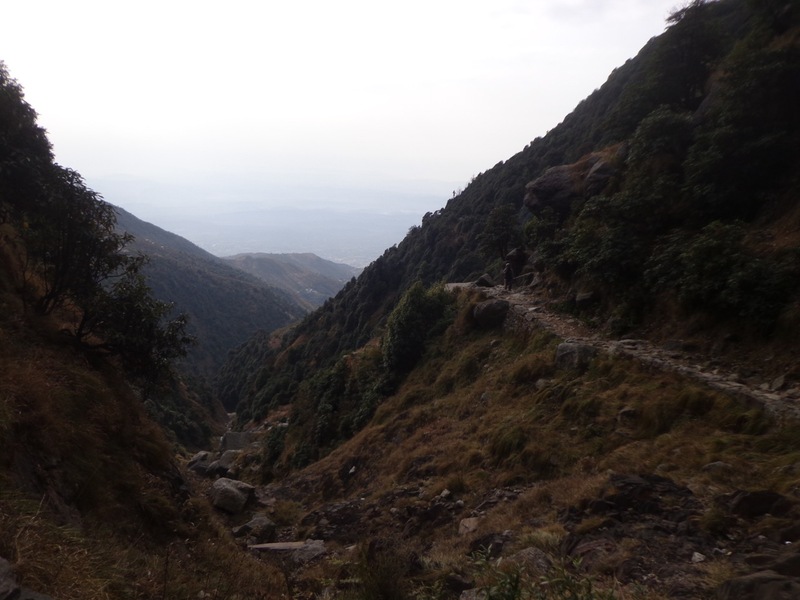 The metalled road on the right also reaches Dharamkot but it would take longer. 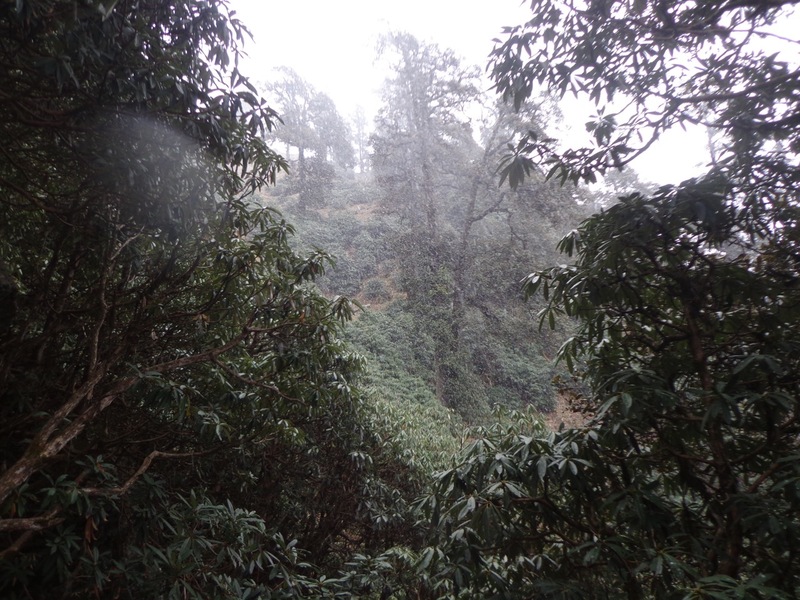 I had my breakfast at Dharamkot – a modest cup of tea and an omelette. I had tea and omelette from this shack and asked for directions. The shopkeeper showed me the road to take. However, I misunderstood his instructions. Instead of taking the hiking trail, I took the paved road. It eventually led me to the same spot but I had perhaps walked an extra km or two. 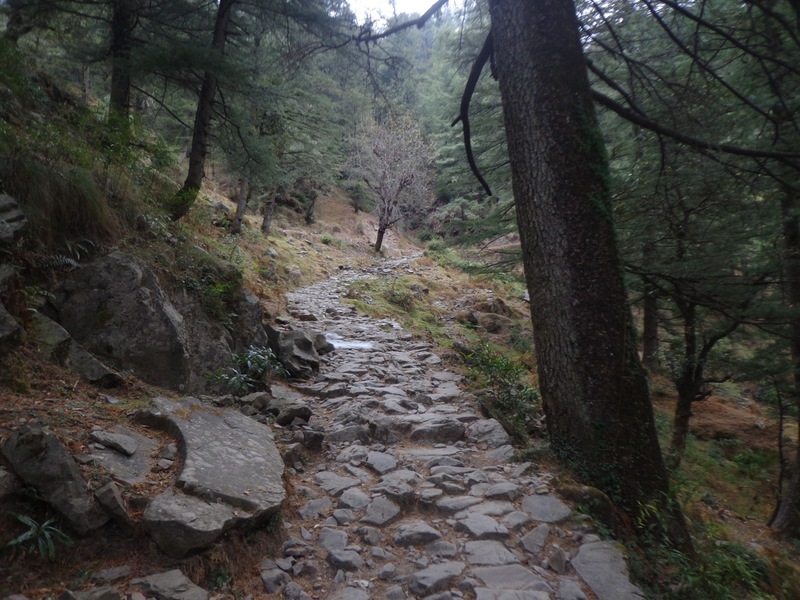 The walking trail to Triund is between the trees and the wall that belongs to Govt. Primary School of Dharamkot. I took the proper road instead. The longer road offered some great views of the forest on the slopes of the mountains. 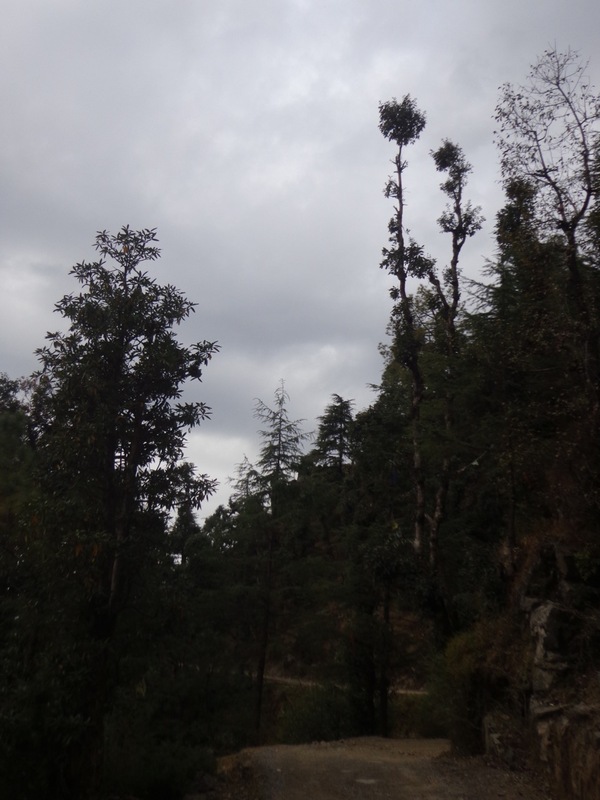 It took me about one and half hour from McLeod Ganj to reach a place called Galudevi temple. In that time I had travelled about 4 kms on gently sloped, well paved roads. One can also reach this place via an auto or taxi (but that wouldn’t have been as much fun). There is a tea stall adjacent to the temple where I had my second cup of tea. The shop also sells and rents woollens and camping gear for underprepared trekkers. 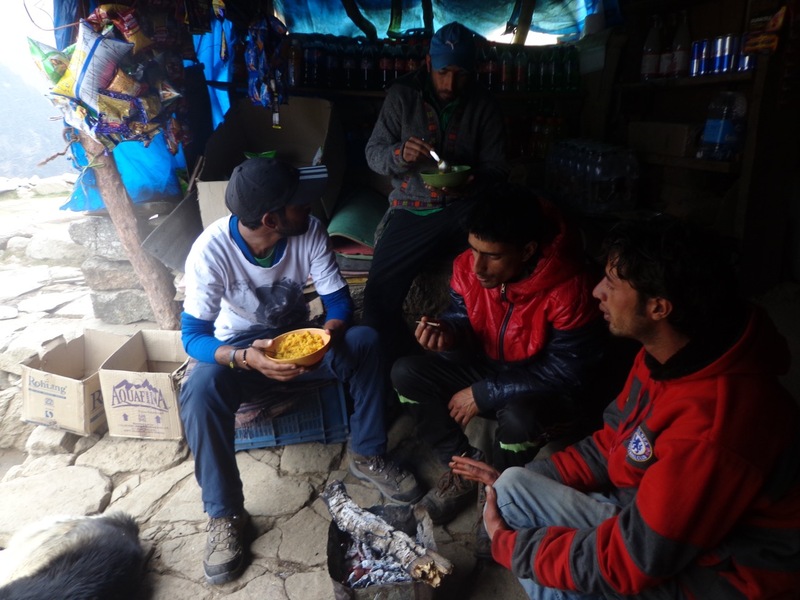 All trekkers must also make an entry in a register kept at the shop and provide them with emergency contact numbers. The person at the register briefed me about the 6 km route up ahead and said that an experienced trekker would do it in 2 to 2:30 hours while an average guy would do it in 3 to 4 hours. 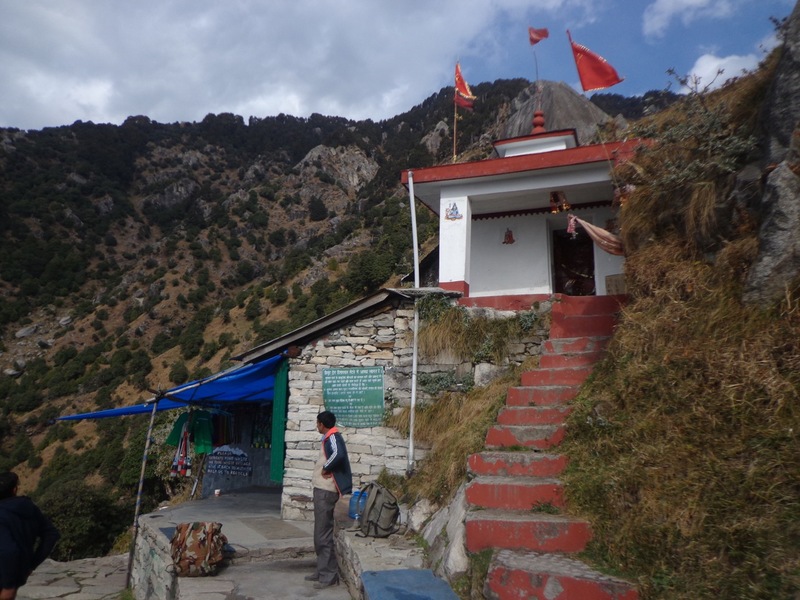 Galudevi temple and the tea stall. I met two men working for a trekking agency ad accompanied them. They were porting food ahead of a troupe of foreigners. The elder one was Purushottam while the younger one was Kuldeep. Purushottam said that he had worked in Bangalore for three years sometimes in 2000s. I was quick to point out that Bangalore had become worse in these fifteen years and that the roads in my locality were worse than the trail we were walking on. Purushottam carrying food for the troupe of foreigners who were scheduled to arrive in a few hours. 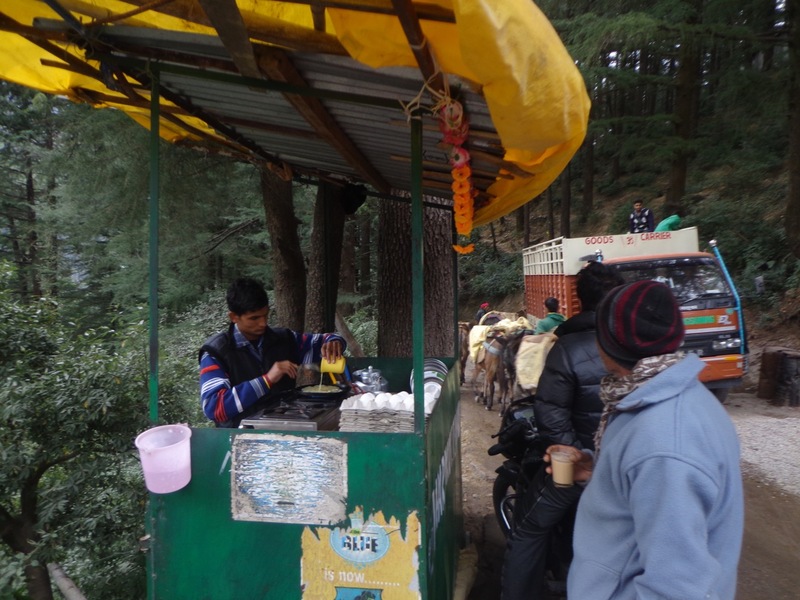 We stopped at the first tea stall on the rocky trail. 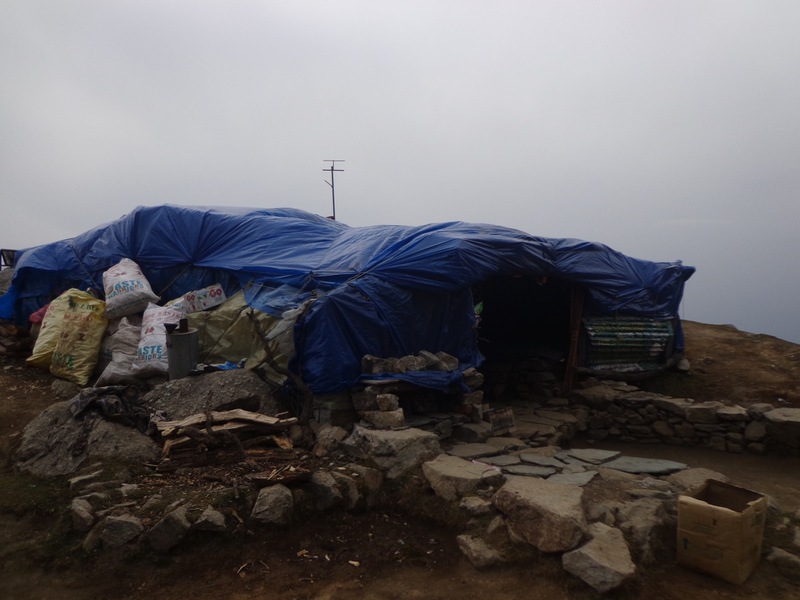 The shack belonged to an elderly man called Om Prakash. He lamented that the government agencies had come and thrown some of his stock in the valley below. Technically, the land belonged to the forest agencies and the shacks were illegal. He was sad that the guys targeted only him. Purushottam and Kuldeep taking a break at Om Prakash’s tea shack. The brook down below is the closest source of water for the shacks on the trail. I bid my two companions goodbye at about 7 kms into the trail (from my source) at a shop called Magic View. Magic View’s board claimed that they were the oldest tea shop on the trail. 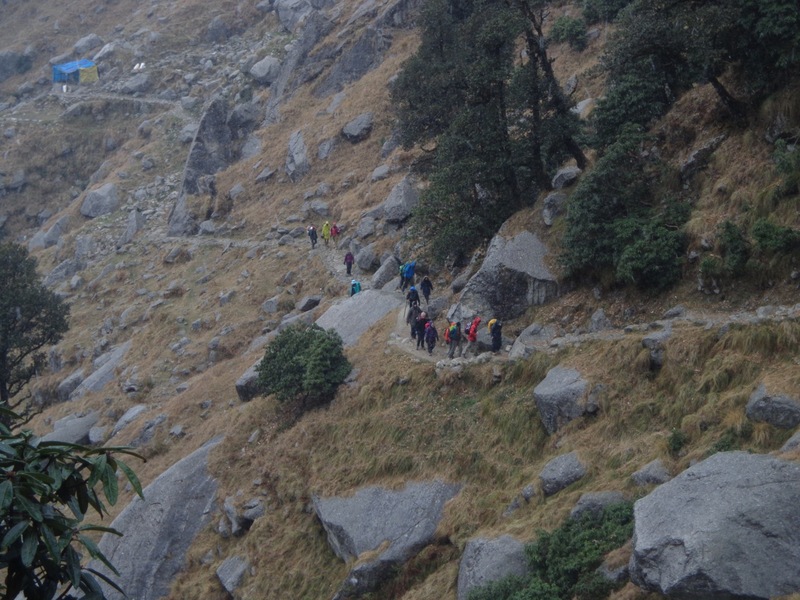 Purushottam said that they would start preparing the soup once the foreigners were visible on the trail below. 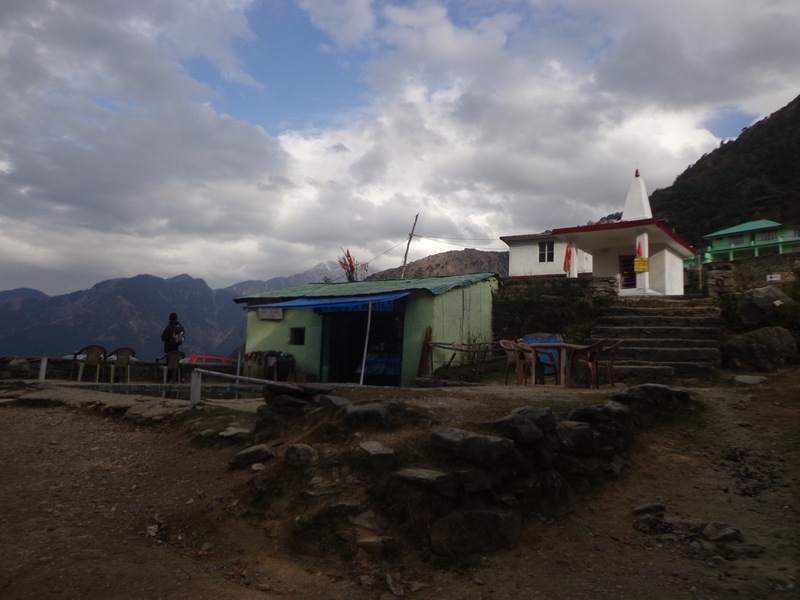 Magic View tea shop is situated midway between Galudevi temple and Triund hilltop. The trail becomes very steep in the last two kilometres. I took it very slow and stopped at two places to have some water and chocolates. The trail becomes this steep in the last two kilometres. 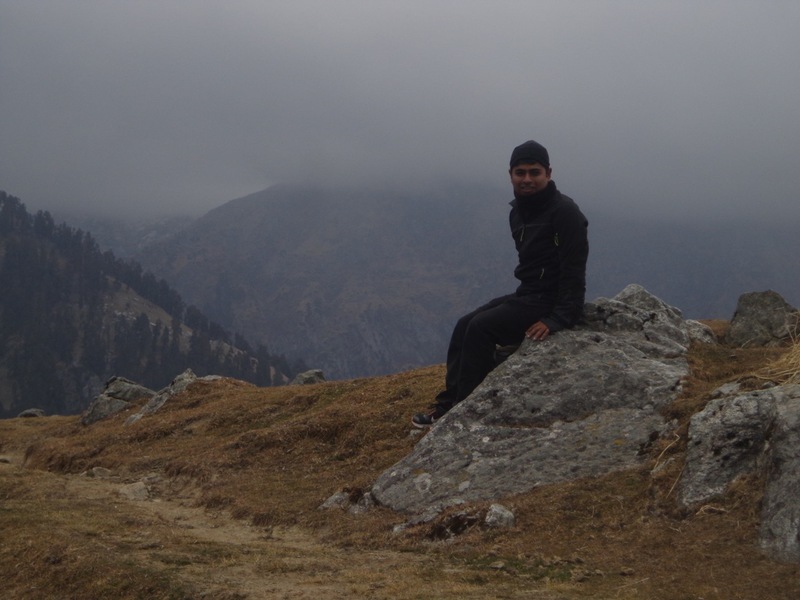 I was at Triund top by 12:15 pm. That puts my timings on the longer side of an experienced trekker. The view was breathtaking. There was an unusual chill in the air. My fingers were slowly getting numb. These were the warning signs of something that I was yet to experience. 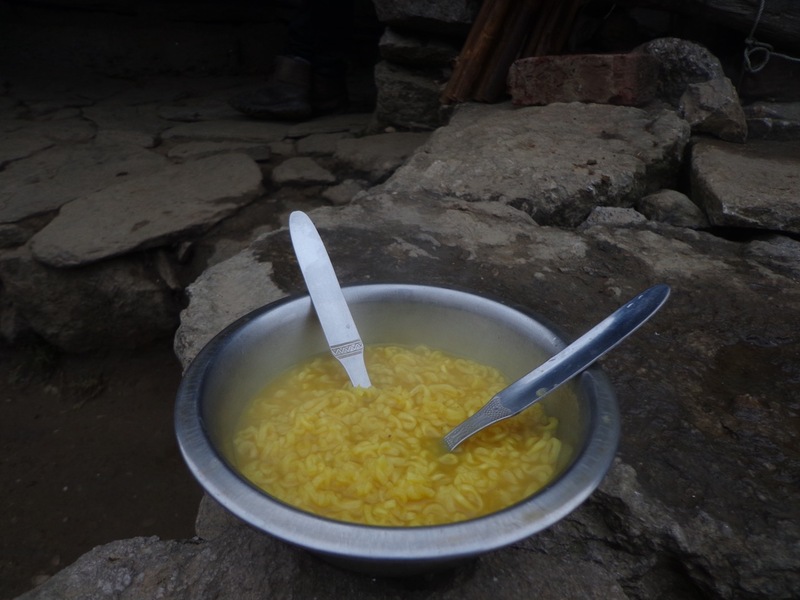 I had my lunch at one of the five shacks at Triund. It was called Sunil’s Chai Shop. Everything up there was overpriced. I knew that I was also paying for the labour that involved carrying everything on one’s back to such heights. An expensive bowl of Top Ramen. It was godsend after the trek. I had to eat it really quick (even by my standards), otherwise it would go cold. I went around the entire camping ground and clicked a lot of photographs. 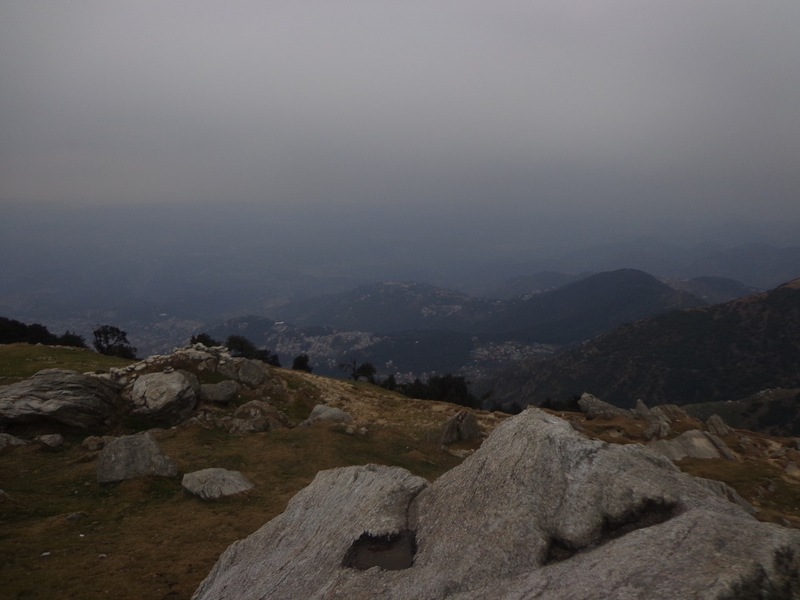 A panorama of the Dhauladhar range from Triund. Notice the clouds building up. Dharamshala region looks tiny from Triund. This is me posing with a darkened Dhauladhar range as backdrop. Sunil and his guys were making a portable bonfire. 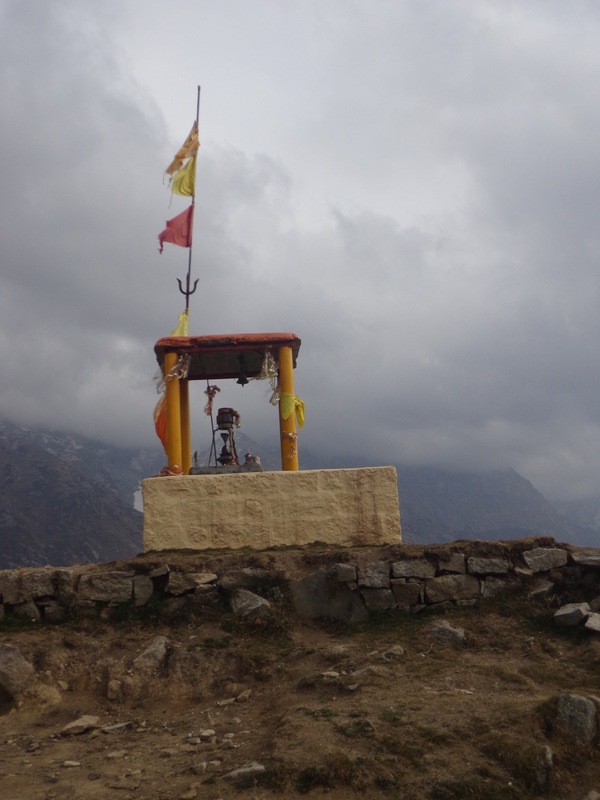 There are three such temples around the camping ground. Then the unthinkable happened. I was at the other end of camping grounds, when it started snowing. It started with one or two flakes but soon developed into a full fledged snowstorm with cold sharp winds hurting my bare fingers. 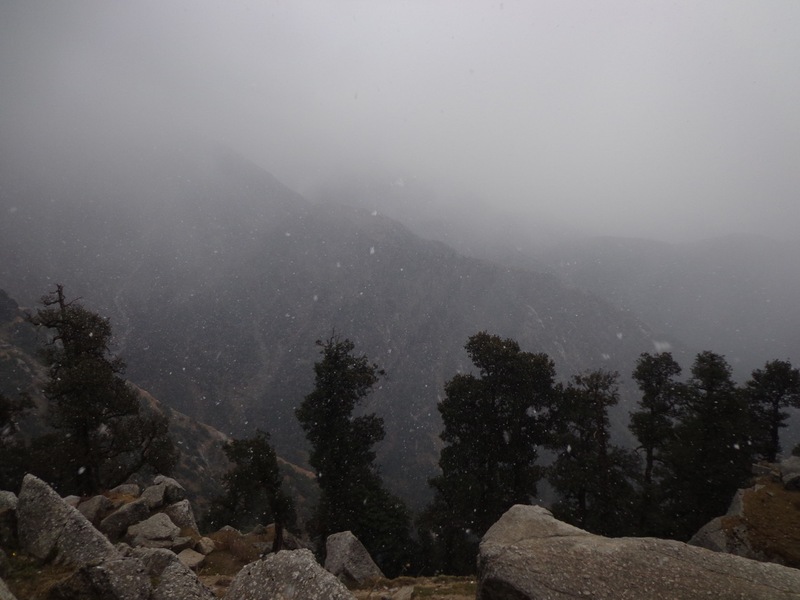 There was a snowstorm in Dhauladhar range and we, at Triund, were feeling the peripheral effects. Snow flakes were hitting against my face and hands. As soon as they melted, I felt a sharp tingling sensation. A large group, including me, took shelter at Sunil’s Chai Shop. Here is a video depicting the scenario. As soon as the snowstorm subsided, I decided to descend. This was necessary because of multiple reasons. I was getting late. It was already past 2:00 pm. I did not have adequate gear to combat a snowstorm, although my water-repellant Quechua jacket and pants were holding pretty well. The snow would make the rocks slippery. That would make descending difficult. 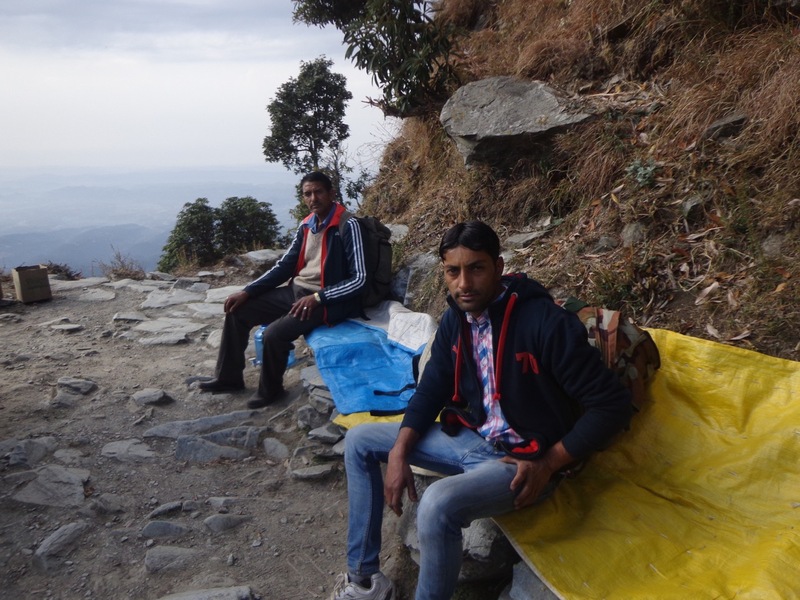 I met a lot of people while descending, including Purushottam and Kuldeep. Almost all of them had taken shelter under the rocks or trees. These people had the intention of camping overnight at Triund. I did not have that luxury. I had to reach Galudevi temple by 4:00 pm. In fact, Purushottam himself lauded my decision to go on. I was descending in snowfall. Also, I was on the leeward side! Triund hilltop must have been experiencing an even worse snowstorm. Those were the troupe of foreigners. I was more happy to see the gentler slope. I took a photo of Triund from the gentler road. It was drizzling on me. My water-repellant garments were doing an excellent job. 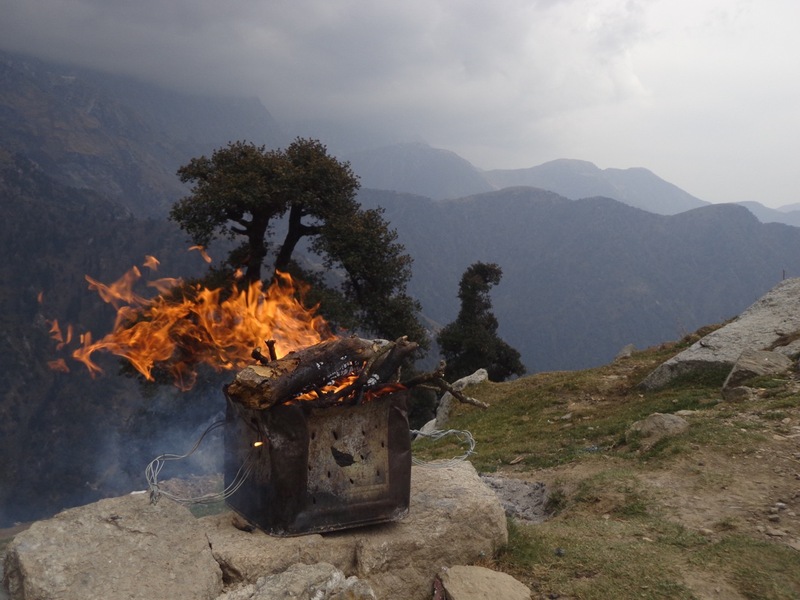 Triund, on the other hand, was not in such excellent condition. 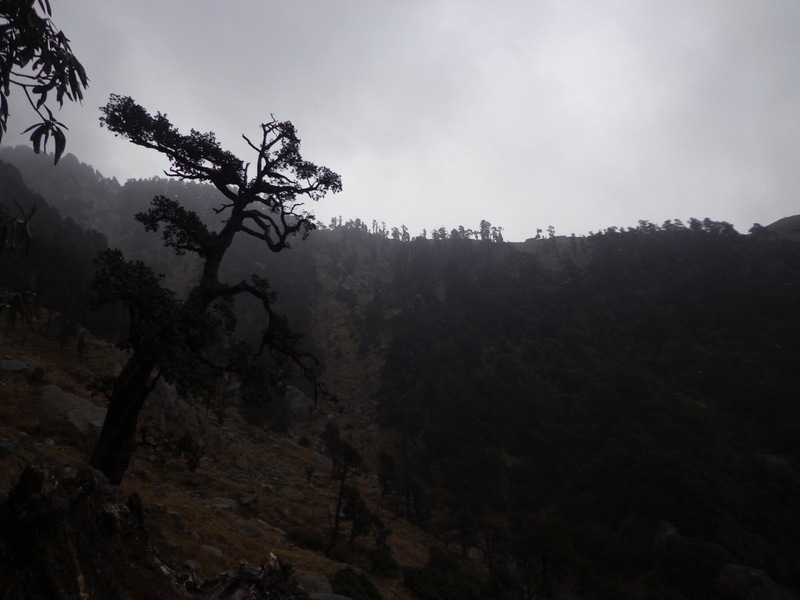 Triund was covered in clouds. It was drizzling but I was happy that I had escaped the snowstorm. Om Prakash’s tea shack was closed. I later met him at Galudevi temple. 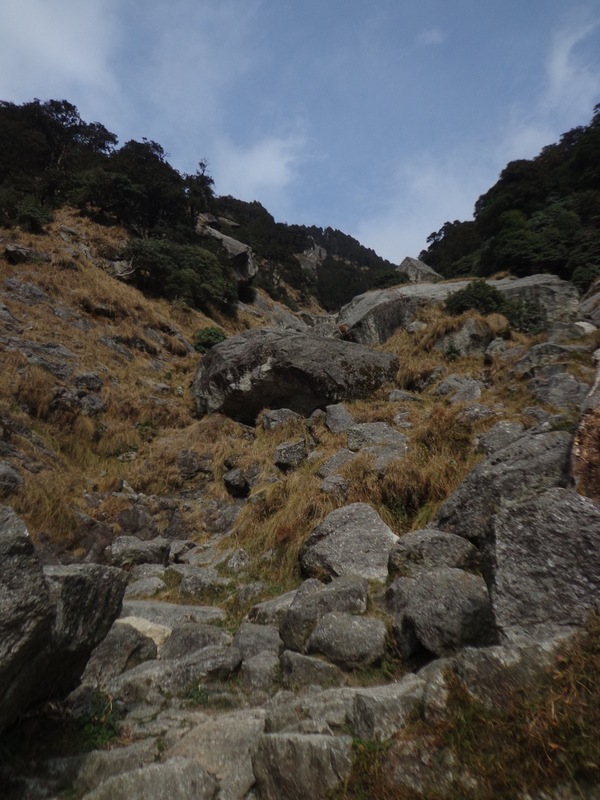 I noticed the trail connecting Galudevi and Dharamkot that I had missed earlier. I decided to take that and save some time. I had descended pretty nicely so far. Om Prakash, whom I met at Galudevi tea stall, asked if I had run through the trail or not. I replied that on the contrary, I was putting my feet very cautiously. 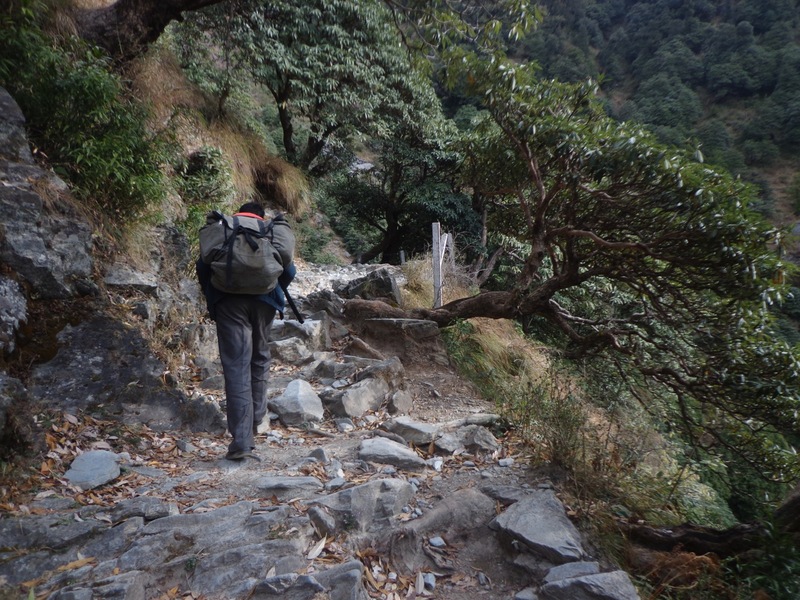 I took the walking trail from Galudevi to Dharamkot this time. I was back at Backpackers Inn by 4:30 pm. The snow and rain had caused the temperature to dip considerably. My mobile showed that Dharamshala was experiencing 6 °C.